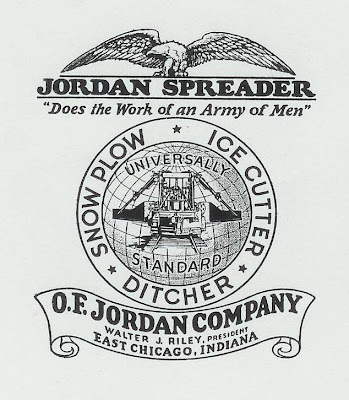 Oil-Electric: Jordan Spreader - Does the work of an Army of Men! Jordan Spreader - Does the work of an Army of Men! Canadian National Railways Jordan Spreader 50192, Prince Rupert March 14, 1958. 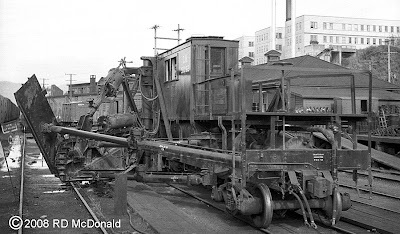 A gentleman by the name of Oswald F. Jordan a roadmaster on a New York Central subsidiary when in 1900 he invented a combination spreader-ditcher. In 1905, he left the railroad to start his own business and he purchased land in East Chicago, where he set up his works. Just one of many MOW – Maintenance of Way machines, the Jordan spreader was used for maintaining trackside structures including profiling drainage ditches, slopes in cuts and embankments, spreading ballast, and even snow removal. An absolutely fascinating piece of machinery! I always got excited watching the maintenance people at work on her. When this wing was extended for repair, the whole unit shook, pneumatic valves snorted, and she seemed ready to tip over! The giant building on the bluff above the CNR yard was the Elizabeth Apartments, destroyed by fire on November 17th, 2004. Jordan later became Jackson-Jordan, which became part of Pandrol International in 1990. Pandrol also absorbed, among others, Speno Rail Services. With all this corporate stuff happening, apparently now operates as Harsco Track Technologies Division. In 2001, the Jordan Spreader was inducted into the North America Railway Hall of Fame. 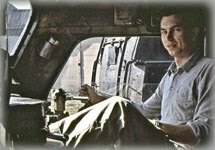 Two gentlemen, Paul Strubeck and Jim Otto, have created the essential Jordan Spreader web site I encourage you to look this site up and let them know you appreciate their efforts!